Unbeknownst to me, Chrysler has been selling cars in New Zealand, presumably to the MOPAR-or-no-car contingent of wealthy sheep that live there. Or, rather, Chrysler did sell cars down there. 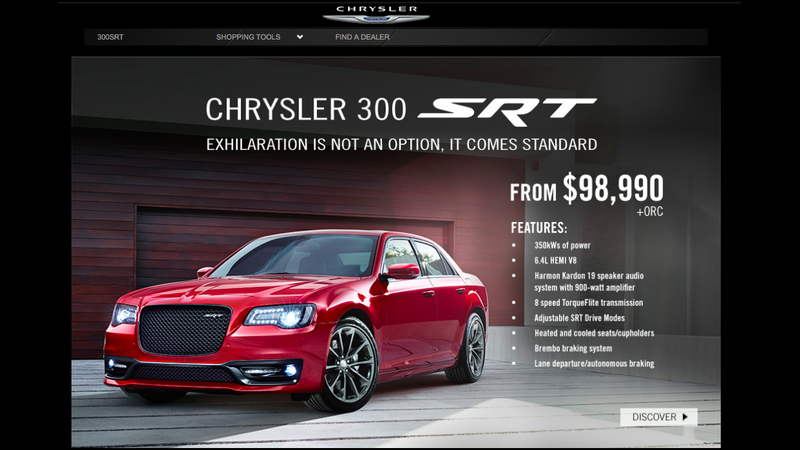 The same is also true of Dodge New Zealand, though it’s landing page is at least typo free. It should not be forgotten that Chrysler Co. products were once assembled in New Zealand, though that fizzled out from the ‘80s into the ‘90s. I looked up a saved version of the Chrysler New Zealand page from earlier this year on the Internet Archive to see what was for sale. As far as I can tell, only one car was offered... and it was the 300 SRT? Yeah. The 300C SRT has been the only Chrysler for sale down there since May, as local Motoring NZ pointed out at the time, noting that while Jeep is still gonna be going along fine, things also look quiet for Dodge. We don’t even get that thing here in the U.S. anymore (though I loved it when we did), so now I am retroactively jealous of the straightforwardness of Chrysler New Zealand’s product line of one. We both mourn and welcome the death of Chrysler, and look forward to the day when the only Mopar products are the Alfa Romeo 4C (resurrected), a Chrysler Pacifica Hellcat, and a Fiat Jolly based on the Wrangler platform.